Chris thought about it, "It doesn't depend on your parent but you. I don't judge by parentage its all in the person." He spoke with confidence he usually did. "Yeah, still to be claimed." His voice grew awkward, "But patience is a virtue." He smiled and sighed looking back at the drawing. "Yeah, I guess so. But still, my mother doesnt really have the best reputation." She sighed. 'Well, I hope you get chosen soon. Its always exciting." She gave a small smile. "If you have any questions feel free to ask me or Erin. And theres always Chiron, but," she winked. "He's kind of scary when you first get here." She stood. "Anything else?" Chris chuckled, "No, go ahead." He nodded his head respectfully as she had been here longer. He laughed, "Oh yeah he is quite intimidating." His laugh rumbled deeply for such a young guy. He smiled, "Nice talking to you." "Yeah, nice talking." She walked back over to Erin. "So, ready to go?" She quizzed her, her face happy. Soon they would get answers, maybe even a quest. Chris watched her go and sighed, he grabbed his notepad from the table. He flipped a few pages and there was a small drawing of his home. It wasn't just any house it was home, he missed it so much. He sighed and gave a small smile. It was very decorated, everything was there, except for one thing. His dad. He flipped the pages back and beagn to draw the horse again. Luce turned to look back at Chris. "I hope he will get used to Camp Half Blood," she said with a sigh. "He looks lonely." She rested her hand on the tip of the dagger she kept with her at all times. Her only gift from her mother. Chris froze in his drawing, someone was looking at him. He had always been able to feel someone's gaze it was strange. He looked around and saw Luce looking at him. He nodded his head and went back to drawing as if nothing had happened. Luce wrinkled her nose in amusement. He was shy, it seemed. She sighed and waited for Erin to respond. Glancing around the pavilion, she noted that it was slowly emptying. She caught the eye of another aphrodite girl and turned away. She would never be like them. Maybe in looks, but never in spirit. Chris looked up from the finished drawing. He smiled and looked at all the groups. He chuckled and was almost sure he wasn't son of Aphrodite, he wasn't as good looking or clean as they were. His gaze kept looking around wondering if he would ever even know who his mother was. There was Hera, Demeter and Athena and a few more. He sighed and shrugged, maybe he would find out soon, well he hoped. He stood up and walked over to the girls. "Um, any idea who is doing the dishes? I'll be glad to help if I can." He gave a goofy smile, it was rather awkward for him to just walk up to someone and talk. Luce grinned with amusement. "Wanting to help out with the dishes? Well thats a first. I'm not sure whos on dishes duty, but they would definatly appreciate your help. Here, lets go collect the places and stuff." It will help take my mind of things, she thought, but kept it to herself. Walking over to the Aphrodite table, she began clearing the places. Chris' furrowed his brows. First? He shrugged, it wasn't fun but it helped keep his mind in one place and concentrated off problems. He nodded and quickly began clearing tables. He had to crouch a bit to clean them, his height a big factor in this. He sighed, and put all the plates together at the end of the table before picking them up and placing them at one table all together. Clearing the rest of the plates, she staggered over to the table were Chris had put his. Placing them down, she quickly seperated the pile so it didnt fall over. Glancing at him, she realised she was they were the same height. "Huh, another tall person. Grab those plates and follow me." She picked up half the plates and walked slowly to the kitchen. Chris chuckled and grabbed the plates, following Luce. He looked around as he followed her. I'll never get used to this. He thought to himself as he continued on his way. His whole life had been on a rural ranch, away from city life. He sighed and looked at Luce, "Where do you come from? City or..." He trailed off, allowing her to speak. A sad look filled Luces eyes as she set the plates down on the counter. Filling the sink up with water, she turned to look at him. "I don't know. I came here with a memory wipe. 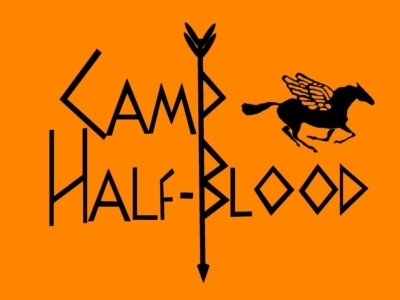 I know nothing of what happened before camp halfblood. All I know is that i was eight or nine when i came." She turned back to the sink, pourng in some soap. Throwing him a pair of gloves, she got out a towel. "You wash, I dry." She set up the drying rack. "Where do you come from?" Cris scowled silently at himself, "Oh I'm sorry, I uh..." He trailed off again. "I um, I come from a small town. It's far away on the other side of the states. I came here by escaping. Don't know what was trying to kill me, all I know is it kille dmy dad and friends." He shrugged and began to wash the dishes his hands bare. He liked the water, as he quickly began covering them in soap and rinsing them. He passed the plates to Luce, "We're here now and I guess that's what matters." He continued for a while in silence, "Do you have anyone left, except your mom?" She took the plates and dryed them silently, thinking. "No, not really. The only person I could count as a friend here would be Erin. No one left out there that I know of." she put the plates in the cuboard, the rythem soothing. She hadent expected her old wound to be opened. "Sometimes I wish I remembered, but what if I did? They wouldent have wiped my memory for no reason." She sighed. "What was it like growing up?" The worst part was that she didnt remember her young childhood before camp. Chris had not remembered he had kind of skipped over it. He slapped a soapy hand to his face, fail. He sighed and continued, almost finishing. "Again sorry, I kind of.. yeah" He thought about it, "Well it was fun and felt normal I guess. Just going out with friends, throwing water balloons every summer day. Riding on my horse in the moonlight, sneaking out. I gues you can do that here too, but well old friends are missed." He choked up a bit. He wasnm't shy to show emotion. He sighed, and tried to smile. Luce furiously rubbed a tear away from her eye. "It's not the same. It will never be." She hated herself for showing emotion infront of Chris, but couldent help herself. "At least you have someone to miss." Her voice cracked and the tears came. Wiping them away furiously, she found she couldent stop. Chris simply put a hand on her shoulder. "Have someone to miss? You have a friend, a true friend." his voice remained calm, "I don't think I will ever have friends like the one I had. They blamed me for her death. " He looked at her, "Hey, be happy you're alive although you have no memory of before. Go out and make new memories. I don't know if its the same for me, but its not about me right now." He sighed and tried to smile again but it came out rather silly and goofy looking. He looked at her unsure of what to say next. He looked at the sink it was free of dishes, so he began to dry them, keeping an eye on her making sure she was ok.
Luce slowly stopped cyring, and turned away from him. She couldent let him see her like this. Even though when she cried it didnt ruin her image. She had found that out before, and still hated it. Who could be friends with a snob? She sighed, runing her hand along her face. "That was so embarrasing. Don't worry, you can make new memories. Were in this together." Picking up the dryed plates she put them away. Chris chuckled, "Trust me, I've seen guys cry worse, and one of them was me." He helped her put the plates away. "Yeah, we are." His voice came suddenly, and a smile spread across his face. He put the last plate away, "Well that didn't take long at all." He winked and rinsed out the sink. It was now shiny and clean. Luce nodded, putting her final plate away. "Yeah, it helps talking to someone." Wiping her hands on her shorts, she motioned towards the battle practicing area. "Want to go practice? I can show you some things if you want." Her hands itched to feel the smooth coolness of a sword, the part of her that always felt missing. She looked at him hopefully. "Sure, If um, Erin? Won't miss ya." He sorely needed to do something, or else he would be on the verge of making the thousandth picture of his horse. He wiped his hands making sure they were absolutley clean. He smiled and ran his hand through his hair. "No, I think shes good. If she needs me she will come fetch me. Follow me." She smiled and jogged out of the kitchen, towards the arenas. Chris nodded and followed, at a quick pace. He kept up easily with her jog with his long strides.